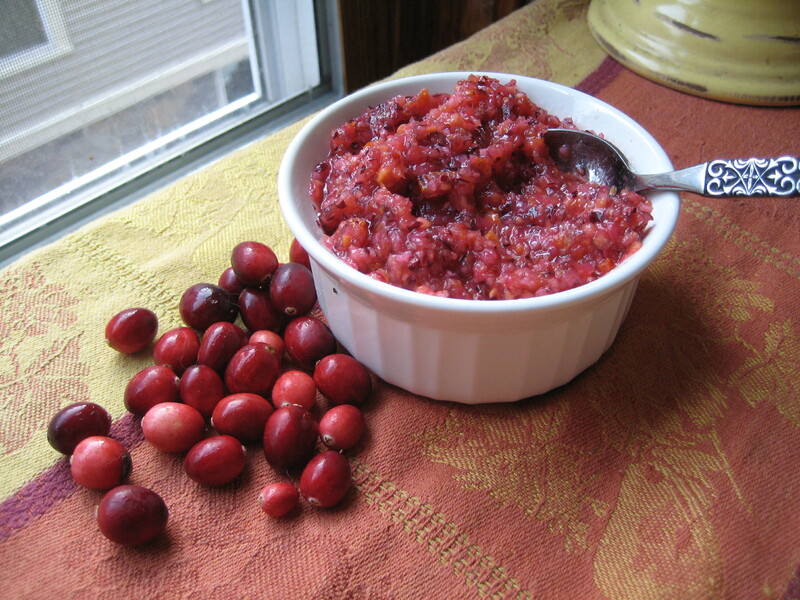 Today’s recipe is a family tradition; every year at Thanksgiving we make this cranberry relish that my Dad had every Thanksgiving when he was growing up. This recipe is fresh tasting and best when made a day or two before Thanksgiving to really allow the flavors to mingle. Wash the orange and lemon and cut up into small chunks (peel and all) and remove seeds. Pat dry the crushed pineapple with paper towels to remove any excess juice. Put cranberries, orange and lemon pieces, pineapple, and nuts (if using them) into food processor. Pulse for 10-15 seconds and stop to scrape the sides. Continue to pulse and scraping the sides until all ingredients are chopped finely. Be careful not to over-process or the texture will be too mushy, the relish should maintain a course texture. Pour the relish into a medium sized mixing bowl and using a spoon stir in the sugar a ½ cup at a time. Since cranberries can vary in tartness, taste the relish after adding the first ½ cup of sugar to determine if the other half is needed. Continue to add sugar until desired sweetness is achieved. Chill in the refrigerator for 24 hours before serving.